Pennsylvania at a camp called Camp Fitch. Have any of you been there? We had so much fun riding horses, canoeing, hiking, and doing our best to hit the target at the archery range. I was very proud of my daughter as she tried new things and overcame fears. We created memories to last a lifetime. I was pretty darn excited about the fact that I felt better than I had in years. I was able to keep up with all of the physical activity and didn’t have any of the digestive issues that I used to combat. The digestive issues that I experienced in the past would have kept me at home. There would not have been these camping memories that I will forever cherish. The combination of better nutrition and my recent addition of running certainly were the reasons I was feeling better. Mental note: Keep eating a diet of fruits, vegetables, whole grains, lean meats, and healthy fats. Make sure to include exercise as often as possible. While the food at the camp was not great from a Real Food point of view, it did bring up some interesting conversations at the table. One of the food highlights was the availability of oatmeal for breakfast. We were all pretty surprised at how our girls gobbled it up. One of my friends said to her daughter, “You know I can make oatmeal for you at home.” That got me to thinking about one of my favorite crock pot oatmeal recipes. I thought I would share it with you here today. 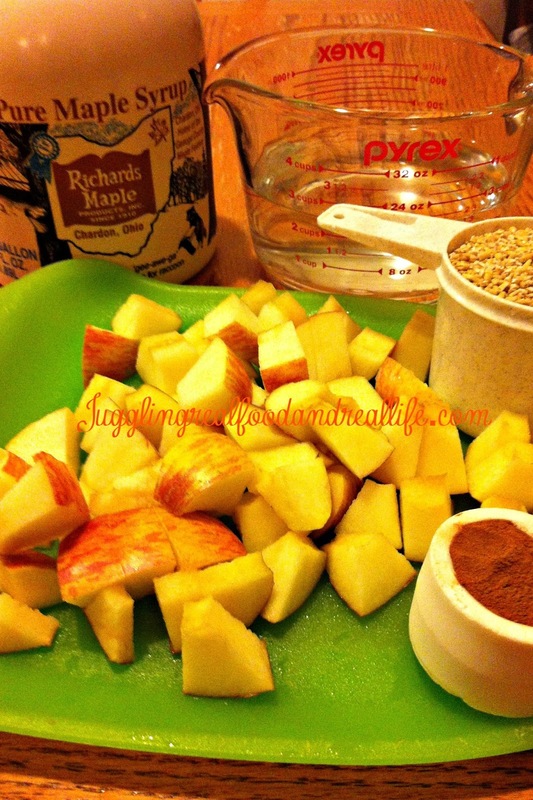 I love this recipe because I can quickly prepare it at night and then wake up to a house scented of apples and cinnamon. In the morning, stir the oats well and scoop into bowls. Serve with a pat of butter and milk or cream. You can also add a little more maple syrup or honey if you like your oatmeal a little sweeter. Enjoy! I like to serve this to my family because it is quick, easy, and full of nutrition. I used to serve the little packets of oatmeal and then I read the ingredients. Lots of things I can’t pronounce and ingredients that are known to be harmful. The little packet was nice, but this recipe doesn’t take any longer and is so much better for my family. Another reason to make your own oats……………it is so much cheaper. Purchase your oats in bulk and save hundreds of dollars per year compared to the individual packets of oatmeal. Now that’s what I call Juggling Real Food and Real Life! Now it’s your turn. I love to hear from you. I work really hard on each of these blog posts and I love the feedback. Questions and comments are both accepted here. I’ll get back to you as soon as I can. Are you a fan of oatmeal? Do you eat regular oatmeal or the steel cut variety? Have you ever had a reaction to food that caused problems with your activities? I invite you to join the fun on our various social media. Just join us by using the various buttons at the top of the page. Lots more recipes, tips and fun to be had by all! You know, I love oatmeal and I always forget about it! Now that the cooler weather is coming again, I need to make it for breakfast for the kids more often! Thanks for the recipe and the reminder! Oatmeal is packed with nutrition, but to be honest……I had forgotten about it too. I was studying up on whole grains and was quickly reminded that I needed more oats in my life. My kids eat pretty well, but seem a bit picky in the morning. This recipe keeps their bellies full till lunch and meets their morning standards. Most mornings I'm in a rush to get out of the house, which usually means I need to pack my meals the night before. I've been in the habit, though of creating a green smoothie for the ride into work. I love this oatmeal recipe though because it cooks over night and I'm sure is easy to pack up in the morning. I just may have to give it a shot! Thanks so much! Hi Jennifer. I totally understand the morning rush. Our mornings are rather like a ballet of chaos. I can quickly scoop the oatmeal into bowls, pour a little milk, and get back to getting ready for work. I usually scoop mine in a to-go container and eat it when I get to work. Let me know how you like it. I grew up going to Girl Scout camp in Pennsylvania, although I don't know Camp Fitch. For some reason I thought you lived in Texas; guess I was totally wrong about that! Camp Fitch is a Y camp. I live in Ohio and it is about an hour away. 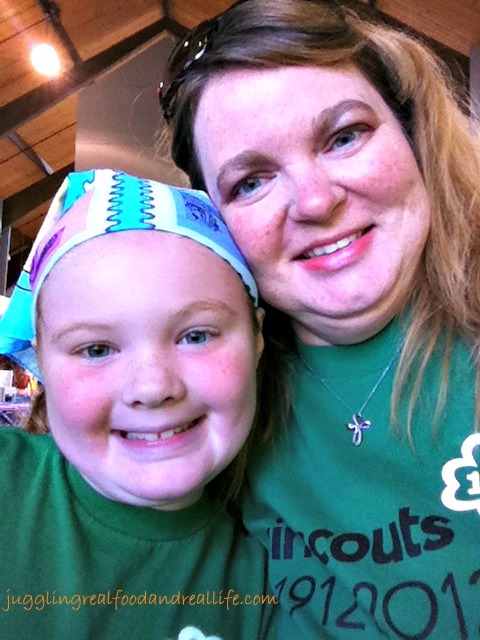 We go to Camp Fitch for a big camporee with all of our area Girl Scouts. A bunch of our area camps have been closed. Big controversy! Anyway……..my daughter and I just have a blast. This was our second year going to this camp. She rode a horse all by herself for the first time. You should have seen the pride all over her face. She was scared, but she overcame her fear. That's my girl! Texas? That is too funny. So you've been imagining me with a southern accent all this time? I don't think my hair is big enough for Texas. How many servings does this make and what size crockpot did you use?